It won’t comes as a surprise to regular readers that I have a thing about maps and that I love nothing more than walking around Berlin. So imagine my excitement when I first saw Kristin Baumann’s S- & U-Bahn Walking Map, which shows the walking time between stations on Berlin’s public transport network. 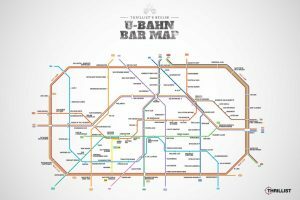 Following the social media success of Thrillist’s Berlin U-Bahn Bar Map, Berlin has spawned a slew of guides based on the S- & U-Bahn network map but Baumann’s is the first I’ve seen that deals with how to get from A to B since the original. 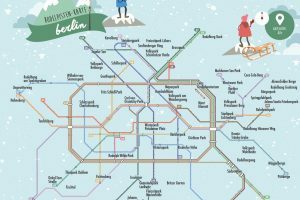 On a trip to London I mentioned a similar map for the tube network (that is mentioned as an inspiration in this medium post) to Steffi and said that it would be great to know the equivalent timings for Berlin. What I found particularly interesting is the ‘Total Walking Distance per Line’ figures in the top left hand corner. Times range from 23 minutes for Berlin’s laughably short and barely used U55 underground line to 14 hours 40 minutes for the S5 overground line that stretches from Spandau in the West to Strausberg Nord in the East. It states on the map ‘Distances calculated using the Google Maps Distance Matrix API’ so it would be interesting to see how accurate the times are by comparing it with real life experiences. Kristin Baumann is a Berlin-based Front End Developer, who describes herself as & Data Vis (data visualisation) Lover and I for one am glad that she chose to funnel her passion into this particular project. As well as the image attached to this post, Baumann published a link to a high resolution pdf version of the map. 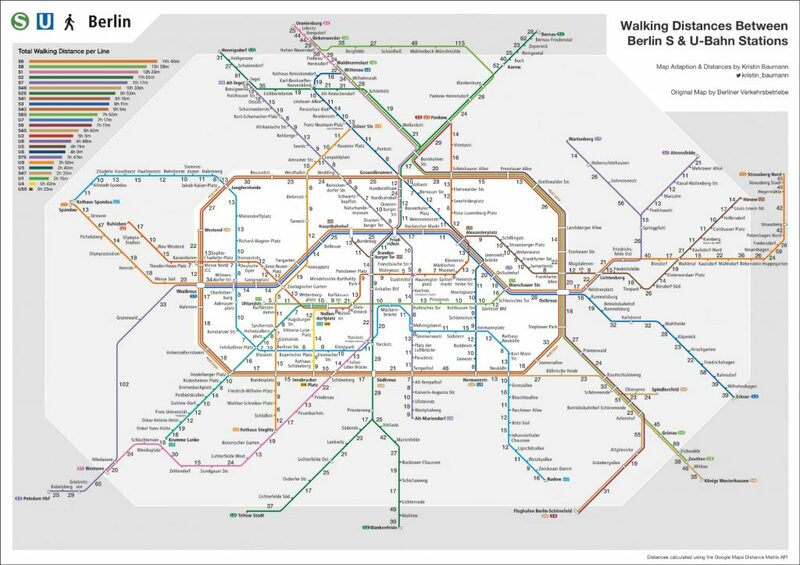 First time visitors and new residents tend to rely too heavily on schematic public transport network maps to navigate their way around a city so this S- & U-Bahn Walking Map by Kristin Baumann should save a fair few people some wasted time on needless train journeys.